The winner of the last Great Wednesday Compare ( Gone With The Wind vs. The Wizard of Oz), with a final score of 7-6 was The Wizard of Oz. I hope the GWTW fans forgive me. At first it was a tie and the rules clearly state that the tie-breaking decision falls to me. It might seem a little unfair, but really it's the only time I get any vote in these proceedings. I haven't read Gone With The Wind, and have only seen bits and pieces of the movie. 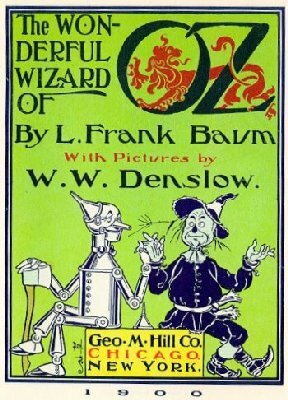 As for The Wizard of Oz, I've seen the movie a dozen or more times, but again, I think I've only read a few selections of the book. In any case, the fantasy world Baum created holds far more appeal to me than Mitchell's. I'll be perfectly honest, while I knew Mitchell's had won a Pulitzer, I thought it was one of those books that no one read any more. Fortunately the GWTW supporters over the past few weeks have set me straight on that account and I've an actual desire to read it now. Not enough to make me vote in its favour, but it's a small victory. I should also confess that the Wizard of Oz was my wife's favourite movie as a child and when we first met, she could still recite the thing from beginning to end. So, some 70 years after TWOZ lost the best picture Oscar to GWTW, it finally gets its revenge. I think the Great Wednesday Compares are on par with the Academy Awards, don't you? Remember, vote simply by adding your comment below, base it on whatever merit you choose, voting does not end until Tuesday at 11:59 p.m. (Sept 29, 2009), and if you want your book to get more votes, feel free to promote them here or on your blog! The Wizard of Oz, of course. I have left Tara and am heading down the Yellow Brick Road to see the Wizard. Gotta go with The Wizard of Oz. After all, Atlas only shrugged because Rand dropped that huge book on his shoulders. Oh, John, only because you make me... I'll have to now vote for the Wiz of Oz as I haven't read Atlas Shrugged. Having suffered thorough many a painful discussion, i.e. being yelled at by an Ayn Randsian, I'm going with Wizard. I will have to go with Atlas Shrugged for the simple fact that in high school, I walked around with a copy under my arm and was all pretentious. I'm not even that fond of the wizard but anything is better than Rand. Well, anything except Dan Brown books. Wizard of Oz - no Rand for me, thanks. Atlas Shrugged. It's the only right wing (!) writing that's broken through my green defences.